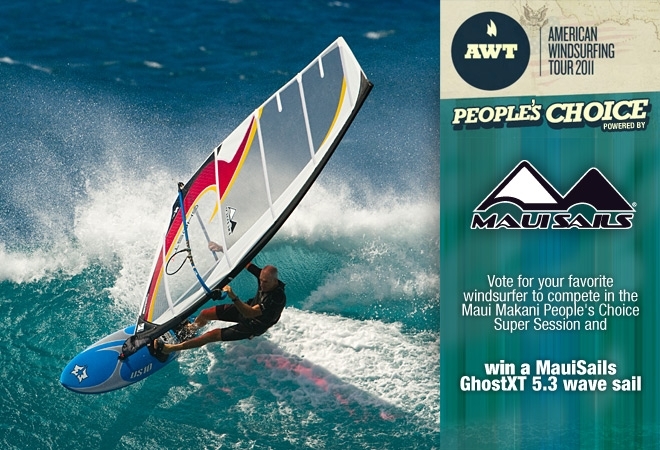 MauiSails is happy to announce their sponsorship of the People's Choice Contest for the 2011 American Windsurfing Tour Maui Makani Classic at Ho'okipa Beach Park. In addition to the normal contest, voters who follow the link at the MauiSails widget will be able to vote for their favorite contestant as well as be eligible for winning a new 5.3 Ghost XT wave sail, one of the hottest new designs from the first sail brand to emerge on Maui. The GhostXT utilizes Technora fabric to produce amazing handling and range in an ultralight, soft feeling performance package. Get in early and vote your favorites.